Rascal Flatts members pose with Children’s Hospital child ambassadors and Champ, the hospital’s mascot. From left: Gary LeVox, Logan Miller, Champ, Lucy Schmitt, Joe Don Rooney and Jay DeMarcus. Photo by Steve Green. 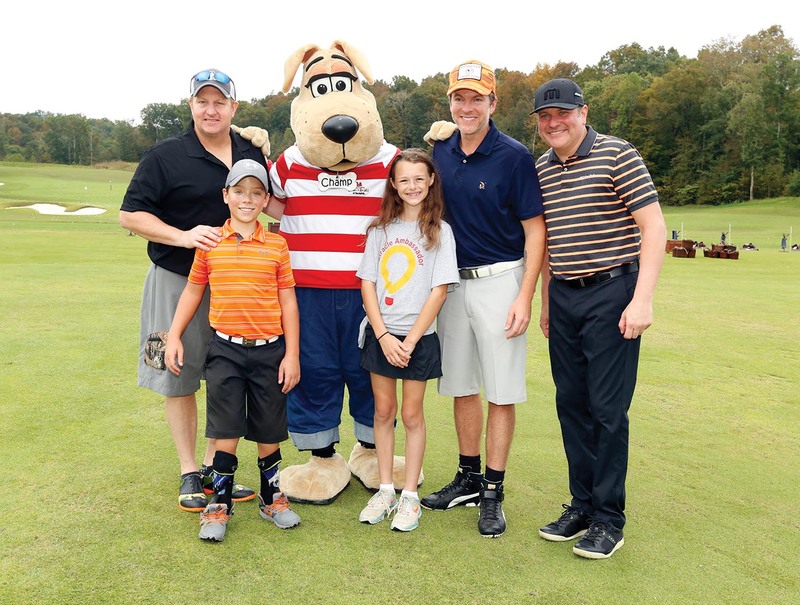 Superstar vocal group Rascal Flatts joined Delta Dental of Tennessee and WME to host a celebrity golf tournament to benefit Monroe Carell Jr. Children’s Hospital at Vanderbilt. All proceeds support research and fellowship training in the Division of Pediatric Urologic Surgery at Vanderbilt University Medical Center. Rascal Flatts’ Celebrity Golf Classic was held in October 2017 at the Golf Club of Tennessee. This community golf event matched 24 teams with a celebrity. Jeff Ruby’s Sponsor Celebration and Celebrity Jam kicked off the event the night before, featuring performances by artists including Kix Brooks and Brian White. Rascal Flatts also performed for participants and sponsors following the tournament. Rascal Flatts members Gary LeVox, Jay DeMarcus and Joe Don Rooney are longtime supporters of Children’s Hospital. The multi-platinum recording artists have performed for Children’s Hospital patients for 11 years and helped raise millions of dollars for the hospital, which renamed its Pediatric Surgery Center The Rascal Flatts Surgery Center in 2010. Delta Dental of Tennessee and WME helped launch the event in 2016 to benefit the Growing to New Heights Campaign, which supports the Children’s Hospital four-floor expansion currently underway. WME, which represents Rascal Flatts, has partnered with Children’s Hospital over the years, including volunteer visits each spring. “We were so excited to have Rascal Flatts lead this event and are immensely appreciative to them for their ongoing and steadfast dedication to Children’s Hospital,” said John W. Brock III, MD, Surgeon-in-Chief for Children’s Hospital, Monroe Carell Jr. Professor and Senior Vice President of Pediatric Surgical Services. “I also continue to be amazed at the level of commitment that the entertainment and business communities have shown to Children’s Hospital. These partnerships enable us to provide world-class services for children from across Tennessee and around the country.” This fall, the golf classic will be held Oct. 8. For more information, contact Jenny Streams, director of community development, at 615-343-5468.